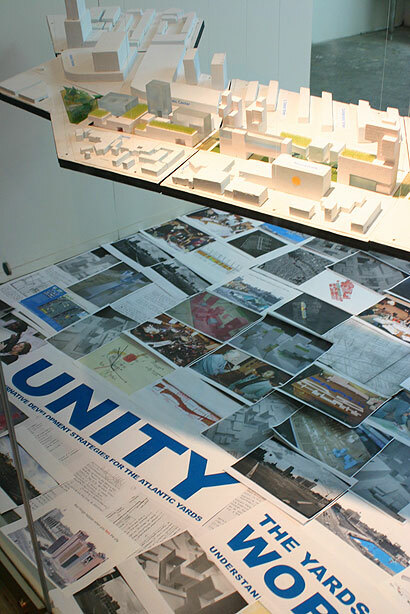 By consulting and working with stakeholders first, participants in UNITY2007 turned the Atlantic Yards process upside down. Passersby can view the UNITY2007 window exhibit at the Soapbox Gallery. University of Cincinnati architecture professor Marshall Brown talked about the collaborative design process and the architecture and planning sections of UNITY2007. Pages from the UNITY2007 report and photos of the April 2007 UNITY workshop by Jonathan Barkey are part of the Soapbox Gallery exhibit. In a photo of more Barkey than we bargained for, the photographer was captured wrapped in a projection of one of his own photos.